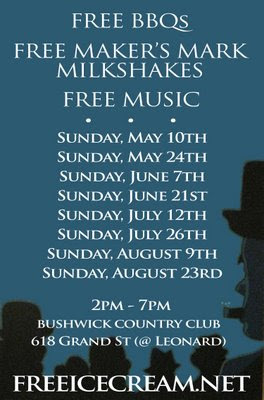 Bushwick Country Club in Williamsburg will be having another free ice cream BBQ today. Stop by today between 2PM and 7PM and they'll hook you up with free food, free music and free Maker’s Mark Vanilla Ice Cream Milkshakes! There is also free mini-golf in their outdoor garden in addition to the cheap beer they serve up inside. Bushwick Country Club is located at 618 Grand Street -- Take the L or G trains to Lorimer / Metropolitan. Here are other dates this awesome event will be taking place throughout the summer. by "free BBQs" they mean, bring your own stuff to grill and you can use our grill for free.